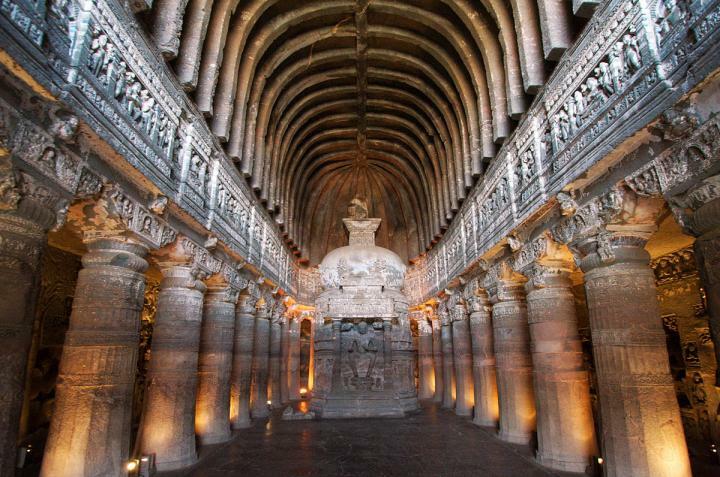 The Ajanta Caves in Aurangabad district of Maharashtra, India are about 29 rock-cut Buddhist cave monuments which date from the 2nd century BCE to about 480 or 650 CE. The caves include paintings and sculptures described by the government Archaeological Survey of India as "the finest surviving examples of Indian art, particularly painting",which are masterpieces of Buddhist religious art, with figures of the Buddha and depictions of theJataka tales. The caves were built in two phases starting around the 2nd century BCE, with the second group of caves built around 400-650 CE according to older accounts, or all in a brief period of 460 to 480 according to the recent proposals of Walter M. Spink. The site is a protected monument in the care of the Archaeological Survey of India, and since 1983, the Ajanta Caves have been a UNESCO World Heritage Site.The area was previously heavily forested, and after the site ceased to be used the caves were covered by jungle until accidentally rediscovered in 1819 by a British officer on a hunting party. They are Buddhist monastic buildings, apparently representing a number of distinct "monasteries" or colleges. The caves are numbered 1 to 28 according to their place along the path, beginning at the entrance. Several are unfinished and some barely begun and others are small shrines, included in the traditional numbering as e.g. "9A"; "Cave 15A" was still hidden under rubble when the numbering was done.Further round the gorge are a number of waterfalls, which when the river is high are audible from outside the caves. Cave 1 was built on the eastern end of the horse-shoe shaped scarp, and is now the first cave the visitor encounters. This would when first made have been a less prominent position, right at the end of the row. According to Spink, it is one of the latest caves to have been excavated, when the best sites had been taken, and was never fully inaugurated for worship by the dedication of the Buddha image in the central shrine. This is shown by the absence of sooty deposits from butter lamps on the base of the shrine image, and the lack of damage to the paintings that would have been happened if the garland-hooks around the shrine had been in use for any period of time. Although there is no epigraphic evidence, Spink believes that the Vākāţaka Emperor harishena was the benefactor of the work, and this is reflected in the emphasis on imagery of royalty in the cave, with those Jakata tales being selected that tell of those previous lives of the Buddha in which he was royal. Cave 2, adjacent to Cave 1, is known for the paintings that have been preserved on its walls, ceilings, and pillars. It looks similar to Cave 1 and is in a better state of preservation. Cave 2 has a porch quite different from Cave one. Even the façade carvings seem to be different. The cave is supported by robust pillars, ornamented with designs. The front porch consists of cells supported by pillared vestibules on both ends. The cells on the previously "wasted areas" were needed to meet the greater housing requirements in later years. Porch-end cells became a trend in all later Vakataka excavations. The simple single cells on porch-ends were converted into CPVs or were planned to provide more room, symmetry, and beauty. The paintings on the ceilings and walls of this porch have been widely published. They depict the Jataka tales that are stories of the Buddha's life in former existences as Bodhisattva. The Archeological Survey of India board outside the caves gives the following detail about cave 4:"This is the largest monastery planned on a grandiose scale but was never finished. An inscription on the pedestal of the buddha's image mentions that it was a gift from a person named Mathura and paleographically belongs to 6th century A.D. It consists of a verandah, a hypostylar hall, sanctum with an antechamber and a series of unfinished cells. The rear wall of the verandah contains the panel of Litany of avalokitesvara". The sanctuary houses a colossal image of the Buddha in preaching pose flanked by bodhisattvas and celestial nymphs hovering above. Cave 3 is merely a start of an excavation; according to Spink it was begun right at the end of the final period of work and soon abandoned.Caves 5 and 6 are viharas, the latter on two floors, that were late works of which only the lower floor of cave 6 was ever finished. The upper floor of cave 6 has many private votive sculptures, and a shrine Buddha, but is otherwise unfinished. Cave 7 has a grand facade with two porticos but, perhaps because of faults in the rock, which posed problems in many caves, was never taken very deep into the cliff, and consists only of the two porticos and a shrine room with antechamber, with no central hall. Some cells were fitted in.